Self-publishing Shoe Print Art became one of the highlights of my life. As a former kindergarten and first grade teacher, I began writing part time while raising my family. For 25 years I had written mostly craft articles, a picture book, and two educational books for teachers. Those two books and my workshops always included two activities children in my kindergarten and first grade classes loved making a bunny and a chick from a footprint shape. One day, I decided to see what else I could draw from the footprint shape. When I drew more than 95 items, I knew I had the basis of a unique book for kids. 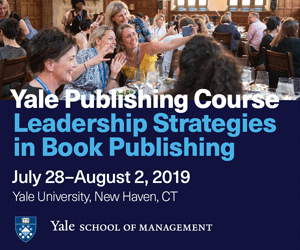 I started proposing the book to publishers in 2003 and I had collected many personal rejection letters by 2009, when a top publisher in New York loved it. The publisher asked if it could hold the manuscript while it restructured its preschool department. Unfortunately, a change of management occurred, and in 2010 my proposal was returned to me. I had been so excited, dreaming of a drawing kit for kids that would sell worldwide. Encouraged by the fact that a top publishing company had shown interest, I decided it was time to become a publisher, and self-publish Shoe Print Art. 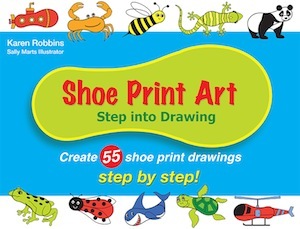 Fortunately, I found top experts to help me create Shoe Print Art: Step Into Drawing Step by Step. Mary Ann Kohl of Bright Ring Publishing, who had been my friend for many years, became my editor, holding my hand and guiding me. Luckily, I was introduced to Sally Marts, a professional graphic designer who had worked in the children’s market, and she loved the project. MaryAnn suggested that I find children from across the country to do the drawings for the book. Such a brilliant idea! So, I coordinated a national search by friends and relatives for drawings from children ages 3 to 15. They were excited to be part of this project and they worked hard, using pencils as they followed the steps shown in the book and then adding their own creative touches with crayons or paint. 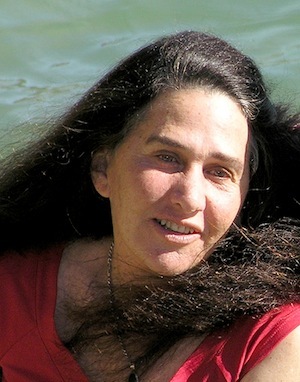 MaryAnn, Sally, and I were a perfect team of creators with different backgrounds and skills. We not only worked well together; we had so much fun creating page by page. Publishing is very hard work, and it should be fun. You’ve got to love your book because it’s going to be with you a long, long time. Previously, I had partnered with Leo Paper on a children’s book project, and I trusted it for quality of work, so choosing that company to manufacture my book was easy. Just a few weeks before the book went to press, it came to me that I should give a percentage of my profit to get shoes for children around the world who need them. I immediately researched relevant nonprofit organizations and connected with Soles 4 Souls. Together, we decided on text, photo, and logo to be included in the book. What have I learned from this? I think the answer would fill another book. It has taught me so much. Believe in yourself. Life is short, so just do it. Find experts with the skills you need to complement yours, and choose people you’ll enjoy working with. Strive for excellence in each step—endorsements, title, cover design, page layout, paper choice, color, type font, price, and more. 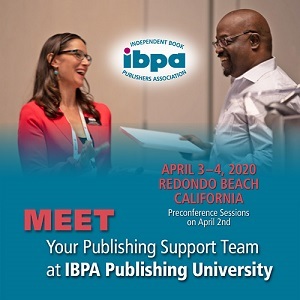 Although it was difficult to find a distributor that would take on a one-book publisher, being a member of IBPA and Book Publishers Northwest was helpful. 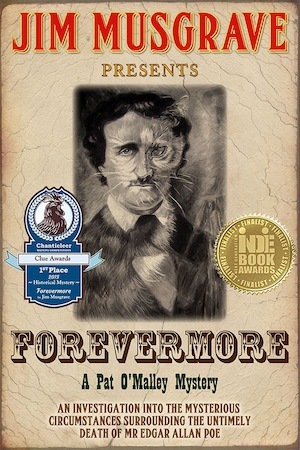 And one of the biggest surprises of my thirty-year writing career was winning an IBPA Benjamin Franklin Gold Award for Best First Book. Yes, I still have a lot of books to sell from my 5000-copy first printing, and I probably haven’t made a profit yet. But I love sharing the book with others and I know generations of children will enjoy drawing from a shoe print shape step by step. Possibly some may even become famous artists. One publishing decision I recently made that has turned out well was to write and publish a lengthy series of short Kindle books in a relatively brief time. Using Amazon Kindle Direct Publishing, I wrote and published one Kindle book every week between August and the end of December 2013—16 titles in the same series, Author’s Quick Guide. They range in length from 4,000 to roughly 20,000 words. 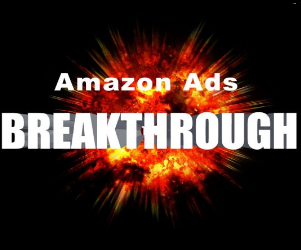 I had been wanting to write a series for a while, and I knew that the best way to get traction and attention from Amazon was to release titles in succession as quickly as possible. When I wrote the first (and shortest) book, my business coach asked me if I could challenge myself to write one every week. Thinking they would all be as short as the first, I agreed. She held me accountable throughout the project to ensure I did not give up, even when I was beyond exhausted. My Kindle sales volume increased 878 percent within the first 12 weeks, and Amazon’s marketing kicked in around Book 6. The books have been selling very well, with sales increasing every month. They cross-promote each other. My e-mail list is growing exponentially. And I’ve created a live Challenge that I now run four times each year to help authors outline their Kindle series and write and publish the first book in a series in 30 days. One thing I learned is never again to write so much in such a short time. I burned out in a big way. Another is that this project elevated me and my business much faster than the path to success I had been on. I don’t pressure my audience to do what I did. But I do believe that every author has the potential to write a short Kindle book in 30 days and that almost every large title can be broken down into shorter series titles. No matter what the genre or topic, a Kindle series sells a lot more books than a single large Kindle book, and it’s less work to market a series. My book-a-week project was a great way to get traction as an author and a coach, to get a large chunk of my next print book completed, and to create the foundation for a trilogy of books that I’m currently writing. 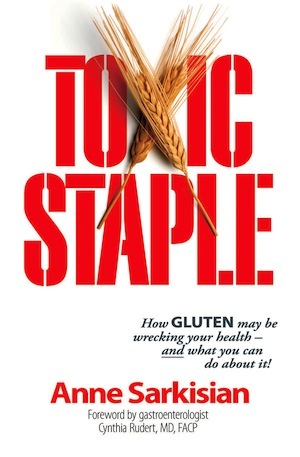 After chatting with a fellow I didn’t even know who was out for a walk, I decided to take on the job of publishing my own book, Toxic Staple: How Gluten May Be Wrecking Your Health— And What You Can Do about It! I’d had some rejections of my book proposal, and since I’m not a doctor or health care professional (I should have two Ph.D.s by now in gluten), I felt I’d have a hard time getting an agent interested in it. The gent’s business-savvy words about self-publishing made so much sense to me that I trusted my gut and decided to take his advice. I surely didn’t want to wait years to get vital life transforming information out to the public after finding an interested publisher and then reworking my book to the publisher’s satisfaction, not to mention losing control over it. And from what I understand, I’d still have had to do most of the promotion. I had a multitude of eye-opening research from around the world substantiating about 60 stories of lives being transformed by adhering to a gluten-free lifestyle. So I established Max Health Press, got a dynamite cover and a brilliant editor, and hired a talented woman to lay out the book and coach me through the publishing process. Every step of the way has been a new learning curve for me, but it has been most exciting. The book has garnered four awards and earned wonderful ratings, reviews, and endorsements— including some that say doctors should read my book. The biggest challenge now is promoting Toxic Staple so humanity can benefit. I have an informative website, with a media page, video, table of contents, and a new blog offering more stories, research, and/or recipes every week. Social media is a challenge for me but Toxic Staple is up on You- Tube, Facebook, and Twitter, and I hope to add other sites when I get a handle on these. 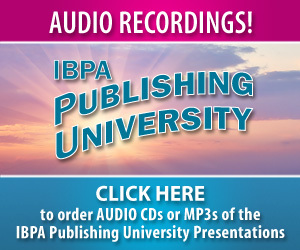 I hired a publicist who got some radio and cable TV air time, and am taking an online speaking program to help me get the word out. I had no idea what I was getting into. This has been one heck of a ride but I’m glad I decided to publish my book myself. The best reward is when people tell me how Toxic Staple has transformed their lives or the lives of people they know. I was rolling out my new business, focusing on developing enhanced EPUB 3 e-books, when my lead designer, Dave Rhoderick, said he thought we should feature development of specialized e-books for families. “You mean, like the one we did for that family reunion?” I asked. “Yes, and we could do books on weddings, funerals, bat and bar mitzvahs, communions, quinceaneras, and just about any other family event imaginable,” said Dave, adding that he could create a demo of a wedding book with help from a friend who is a wedding photographer, and price it out. His suggestions made sense to me since the e-book market— especially just for EPUB3—is not big enough yet to yield the money we need to make our new venture a going concern. The family-friendly e-book we had already done was about a special family reunion held in an old English castle. Family members had taken hundreds of videos and stills at the reunion, but they had no way of creating a meaningful presentation from the images. We were able to turn them into a multimedia diorama. This kind of product can be shared portably by families big and small, and can be viewed as a “special presentation” on smart TVs that are digitally enhanced by simply using a USB device such as a thumb drive. We have confidence that our decision was a wise one. Choosing a method of publication that is flexible (in our case, EPUB) gave us the courage to explore specialized markets, such as families, in order to increase our revenue so we could do even more things (including launch a specialized eReader app) down the line. I have been a nurse for 37 years. In July 2013, I wondered if there was something else I could do that would make me want to jump out of bed in the morning, full of energy and passionate about my life. I decided to take an entrepreneurial course at the School of Online Business, and then I started dreaming about writing a book to empower kids. 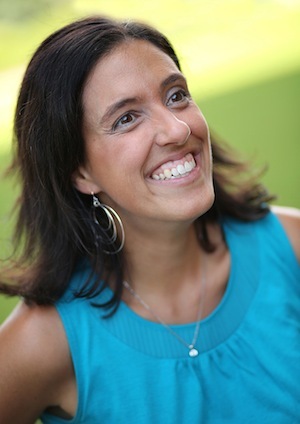 I wrote A Simple Idea to Empower Kids in thirty minutes once I knew that I wanted to talk about the law of attraction for kids using the power of love, choice, and belief, and once I knew who my audience was. 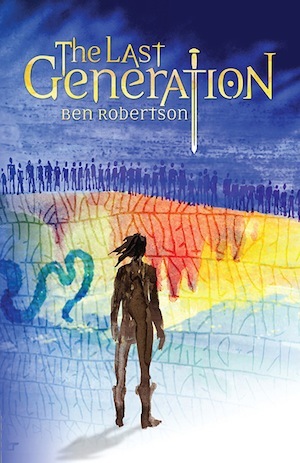 Published in January 2014, by Balboa House (the self-publishing division of Hay House, Inc.), the book won the 2014 Preferred Choice Award in its category from the Creative Child Awards Program. Later, I dreamed that I could appeal to pre-teens and teens if I changed the book’s cover and illustrations. 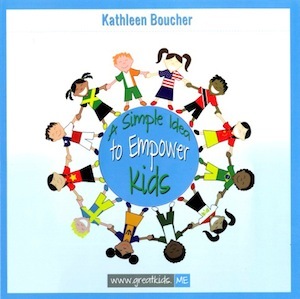 A Simple Idea to Empower Kids: Teen’s Edition, came out in March and won the 2014 Book of the Year Award in its category from the Creative Child Awards Program. I used fiverr.com to find cover designers and illustrators, and I decided to give the ones I chose the freedom to exercise their expertise. I told them to draw what they felt fit the manuscript. What they created was much better than anything I could have come up with. I am not the expert, and I believe that allowing them freedom guaranteed products much better than any I could have imagined. As a first-time writer, I chose CreateSpace to help me produce my book, and I think it was a good choice. My thinking at the time was that I did not know what I was doing so I wanted to work with a company that had a system in place and could walk me through the publishing process. I acted on my positive feelings about Amazon and my belief that it would provide quality service. 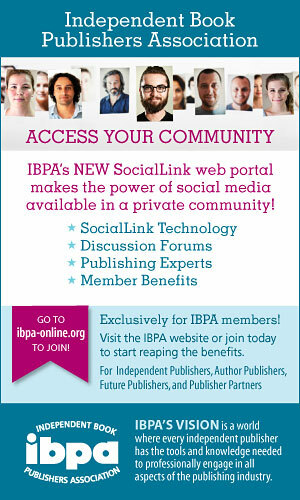 What I learned is how CreateSpace is designed to help writers produce books. 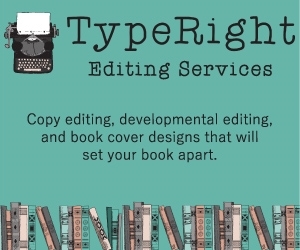 In my case, services included editing, interior design and formatting, writing marketing copy, and listing my book with ISBNs that I provided. I did not use CreateSpace for cover design. The editor CreateSpace assigned was fast and thorough, and she provided excellent feedback, all of which I took into account in my final manuscript. On interior design, CreateSpace did not do as well, but its people acknowledged their role in issues I raised and agreed to make changes without charging me extra. In fact, they even offered a full refund on any services that I was not satisfied with, no questions asked. It will still be a few weeks before I have a hard copy of my book in my hands, but I am happy with how things have gone so far. One of the very best decisions we made was basically to share the wealth. Because of our peripatetic ways, when we decided to take over publishing our own books, we searched for and found a small publisher, Paradise Cay, which worked in our niche market, and we made a deal for it to handle functions including distribution, storage, and website design and management while we handled other publishing tasks, including publicity. We agreed on a slightly higher than normal percentage fee for Paradise Cay back before e-books came into existence. It was people there who convinced us to stick our toes into the e book market when Amazon first became a player. Over the next five years, our e-book sales grew and when they accounted for almost 20 percent of revenue, we had a meeting with the folks at Paradise Cay. They said that the percentage we paid for handling physical books made sense, but that they felt we were paying too much for handling e-books since they had little to do once the e-books were up. Then they left it to us to suggest what their fee should be. We decided to suggest a percentage that was half the commission for paperbacks—and about 2.5 times more than the percentage other e-book distributors charge. As our e-book sales have climbed to about 35% of our total—fortunately while sales of our paperbacks have also risen—Paradise Cay has enjoyed the fruits of all our labors, and shows it by doing special things such as giving our books pride of place in its elegant catalog for gift shops, creating handsome posters for shows we do, and making us feel more like partners than clients.